58 days on the road. Nearly all of which have been spent in snow, rain, and cold. Seeking sunshine, we said goodbye to Oregon. Parked on the streets of upper middle suburbia, I began the rearrange shuffle that takes place each morning. The first task is always folding up the Pack ‘N Play I can either balance between our wall shelves and kitchen counter to Spider-Man myself over the pack ‘n play, or slide off the bed and squeeze into the 6 inches of remaining floor space, between the bed and Pack ‘N Play. I smush baby’s stuffed animals and blankies in their bag, wrap up the Pack N Play, and stash them under the bed. The Pup’s Travel Blanket gets a shake out to the wind, and then rolled up and put away as well. I pull the sheets tight on our bed to flatten out any wrinkles. And then sweep the floor, for what will be one of many sweeps for the day. Even with the no shoe rule, the outside finds its way inside the van. 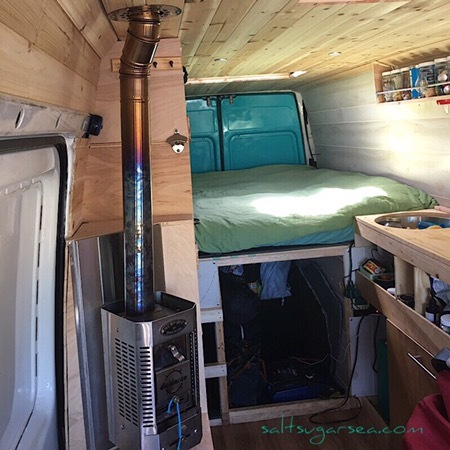 With the sliding door open, a breeze blows in and out of the van. Sun shines warm, welcoming us back to the barefoot season. This is the first sun we’ve felt in months. Nature sounds play softly from one of my Pandora stations. While the laundry is strewn everywhere at the moment, I don’t mind organizing in this warm weather one bit. Evening begins to set in, and little giggles and toy cars start to appear in front yards. Filled with new custom homes, perfect lawns, and tin cup rain catchers, this suburbia has a pleasant welcome to it. A happy vibe that you could almost see yourself in. But we would never last here, for the wanderlust that we treasure so much may burn out. And, so we move on.